Companies are increasingly looking to use video as an effective way to reach employees and drive engagement across the organization. 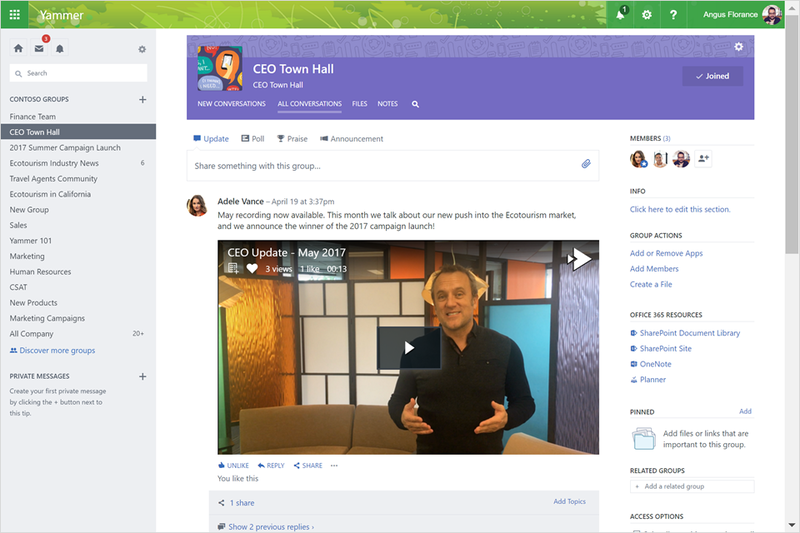 Now, you can share and play videos from Office 365 Video and Microsoft Stream directly within your Yammer conversations. Yammer already offers high quality, in-line viewing of video uploads or external websites like YouTube and Vimeo. These new integrations with Office 365 Video and Microsoft Stream make it seamless to embed internal videos in Yammer conversations and include security controls and infrastructure to keep valuable information secure. To share a video from Office 365 Video or Microsoft Stream, copy the URL of the video and paste it into your Yammer conversation either as a reply or post. Yammer recognizes that the URL is a video, adds a playable thumbnail and allows people in the group to watch the video in the context of Yammer. They will also see the number of views and likes. Those who don’t have access to a specific video will be shown a message that the video is private or the user is not authorized. Whether you are running a monthly Q&A session, sharing an executive message, broadcasting product updates or releasing a campaign, your employees can now share, watch and discuss videos right within Yammer and see tallies of views and likes. 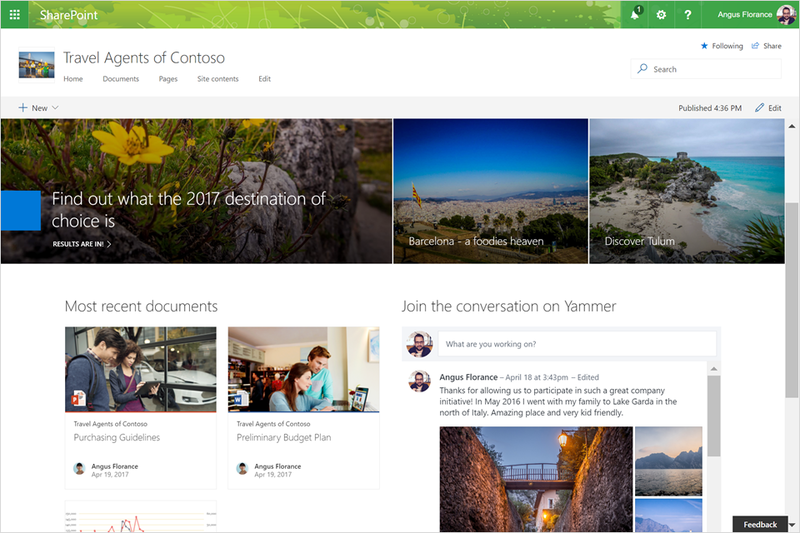 You can now use Office 365 Connectors to bring relevant content and updates from over 90 popular third-party apps and services directly into your current Yammer conversations. Connectors allow you to configure automatic posts to groups from a wide variety of tools, such as news and social media sources like Bing News and Twitter, developer tools including GitHub and PagerDuty, and project management tools like Trello and Asana. Anyone in the group can add or delete a connector in Yammer, as long as the group is connected to the Office 365 Groups service. Simply click Add or Remove Apps under Group Actions (on the right of your group’s feed) and then follow the instructions on how to add the connector. To learn more about Connectors in Yammer, please visit the support article. Connectors bring relevant third-party information right to your group. For example, you can set up a connector to deliver a weekly digest of social media posts or articles regarding a specific hashtag or search term. For groups managing the customer experience, you can set up a connector with your organization’s customer support system to escalate important tickets and drive group problem solving. 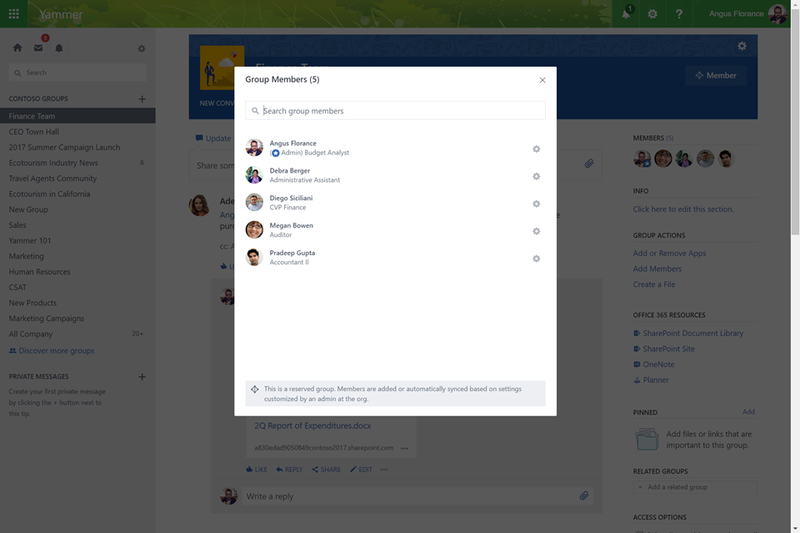 Starting today, you can more easily manage groups in Yammer using dynamic group membership. Dynamic groups are Office 365 groups with membership defined as a rule, rather than as a static list of members, in Azure Active Directory. Whether you’re looking to group people based on role, geography, department or any other attribute, once created, these groups update automatically as people join, leave or move within your organization. So you can rest assured that you are including the right people from across the company to engage and collaborate in your Yammer conversations. To create a group with dynamic membership in Yammer, an Office 365 administrator will need to sign in to the Azure portal, select the Yammer group to configure and set up the membership rules for that group. 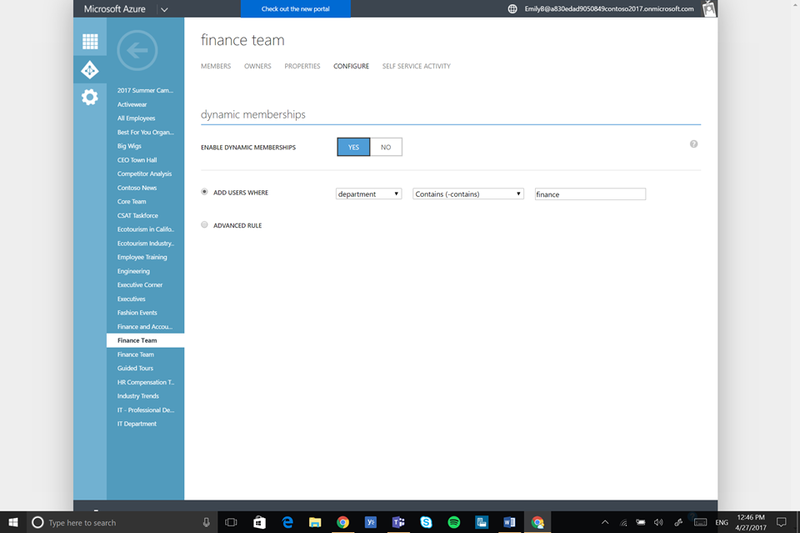 Group members are added and removed based on membership rules set in the Azure portal. This new capability works well for organizations where people often change teams, roles and geographies. For quickly growing companies seeking to bring new hires into group conversations relevant to them, dynamic membership helps to ensure these employees have all the right permissions to find applicable content and make meaningful connections from day one. For companies looking for a reliable and secure way to engage with the frontline, a group with dynamic membership can be created based on a specific role or location. Group managers can then announce major updates, sending a notification to employees’ mobile apps. Conversely, workers on the frontline can share input and escalate issues knowing they’re connected to the right people back in the central office. Staying connected requires tools that have the versatility to fit your work style. Whether you are highly mobile, moving from meeting to meeting, on the ground talking to customers or jumping from app to app on your desktop, your cross-company conversations should be accessible, highly engaging and easy to navigate. 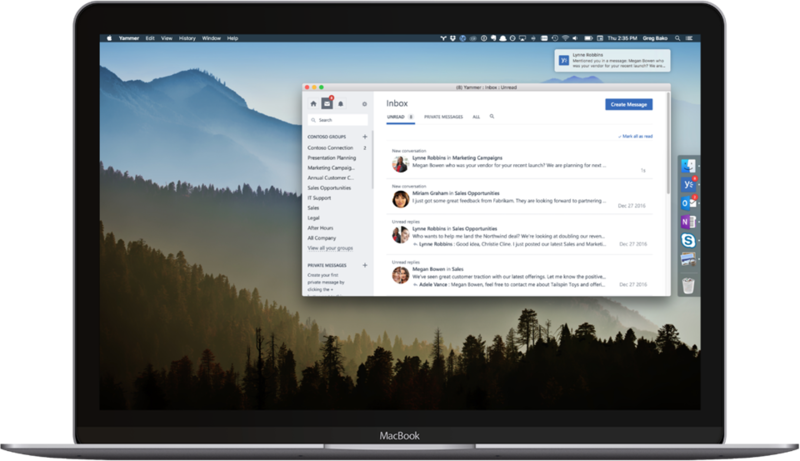 We are pleased to share new Yammer apps for iPad, Windows and Mac. 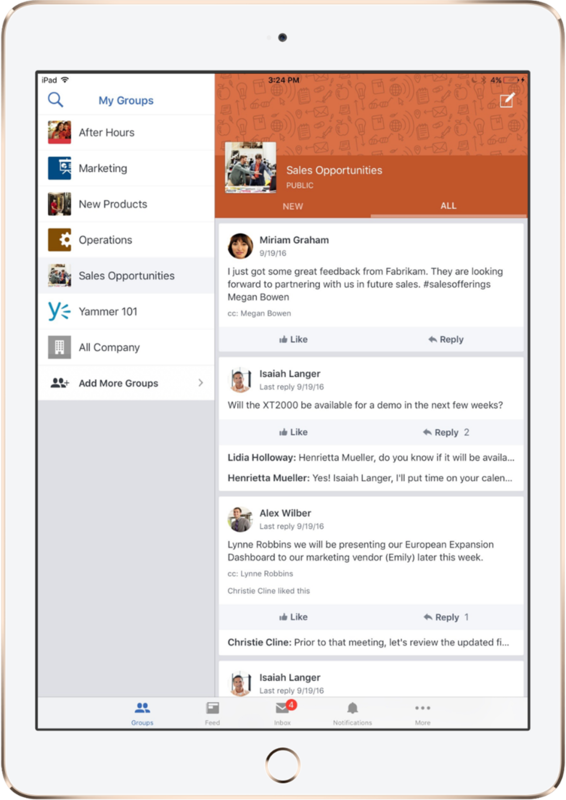 The Yammer iPad app has been re-launched with a richer navigation and group experience, as well as universal search capabilities. With great feedback and usage of our current Desktop Notifier, we will also be delivering a more full-featured desktop app for Windows and Mac within the next couple months. The new app will enable automatic sign-in and will have a similar look and feel as the current browser experience. Organizations will also be able to broadly deploy the desktop app through central management. Also, join us next Tuesday, May 23, 2017 at 9 a.m. PDT for a special Ask Microsoft Anything (AMA) in the Microsoft Tech Community. Our product and engineering teams will be available to answer questions you have about new features in Yammer. Add the event to your calendar and join us in the Yammer AMA group next week. To keep up with Yammer releases and connect with our product teams on an ongoing basis, please join the Yammer Service Updates External Group. Q. How does embedding a Yammer conversation into my SharePoint site work today? A. To embed Yammer on a SharePoint page today, edit the page, insert the Yammer feed web-part from the gallery and enter the URL of a Yammer group or topic. Adding a Yammer conversation into a SharePoint page embeds the exact conversations that you see in Yammer. 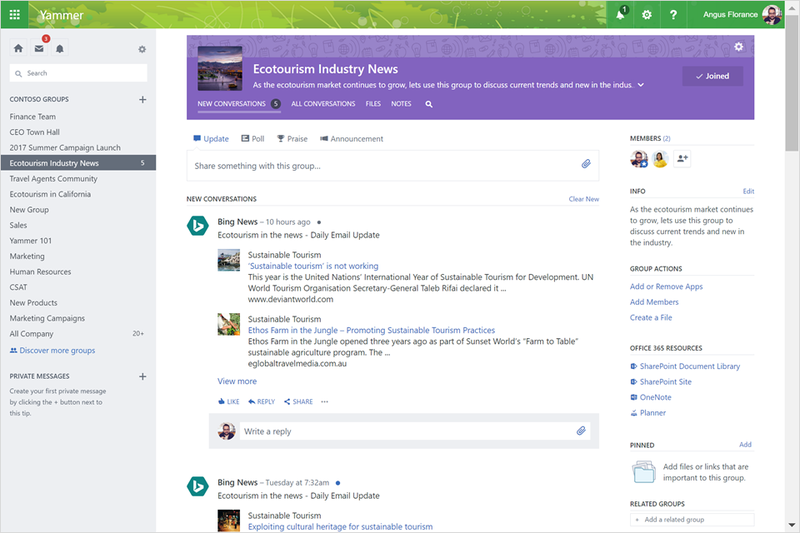 Your group feed in Yammer and the view of the conversation in SharePoint will update concurrently, in real-time. Q. What is the difference between Connectors and Flow? A. While Connectors for Office 365 Groups and the first-party app Microsoft Flow both involve integration with various third-party apps and services, there are several differences. Connectors post updates to your Yammer feed from a specified system. Microsoft Flow can post updates as well, and add the ability to automate multi-step workflows involving actions taken across multiple systems. To learn more, visit the Microsoft Flow website. Q. What are the eligibility requirements for dynamic group membership? A. Eligibility requires that your group in Yammer be connected to the Office 365 Groups service and your tenant be subscribed to Azure Active Directory Premium. Dynamic groups in Yammer currently have a 100K member maximum. For more details about configuration and eligibility, please visit the support article. Forrester's 2016 Enterprise Collaboration Wave report is out and Microsoft is a Leader!